I’ve been enlightened to the world of vegan baking. Two sweet gals, Joy and Jenn, have handed me more than a few vegan sweet treats that really rocked my world. Thus, I was motivated to see if I could return the favor. 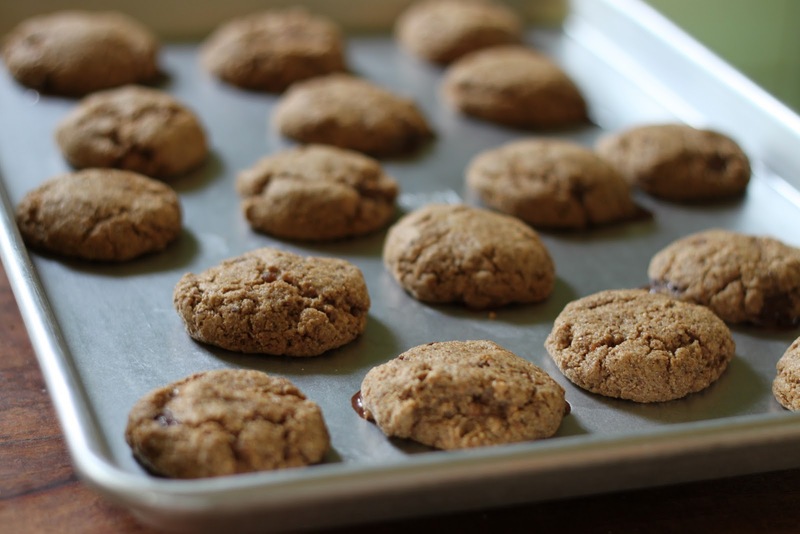 I found a brilliant cookie recipe from Steph Chows. 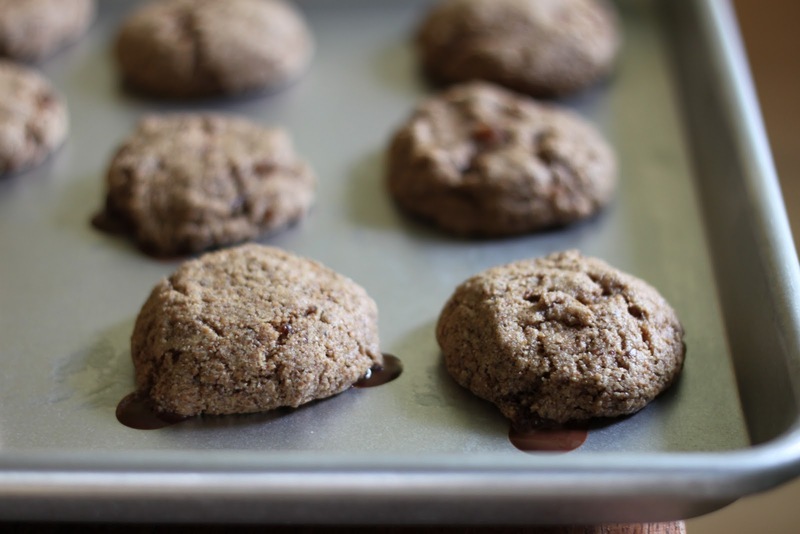 The results: a nutty, sweet, chewy, cookie with a melted chocolate center…a vegan miracle. I’m still amazed by vegan baking, and consider it a kitchen miracle when I cook up something that is not bad for me and also delicious. This cookie could quite possibly be one of my favorite cookies. 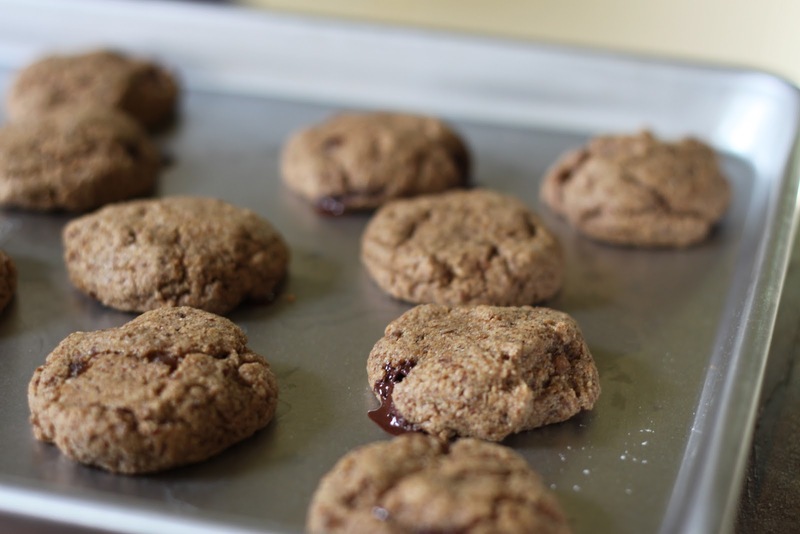 I especially loved the chocolate oozing from the center of the cookies as they were pulled out of the steamy oven. I used my favorite almond butter from Justin’s Nut Butter. It was actually a maple almond butter, which made the cookies even tastier. 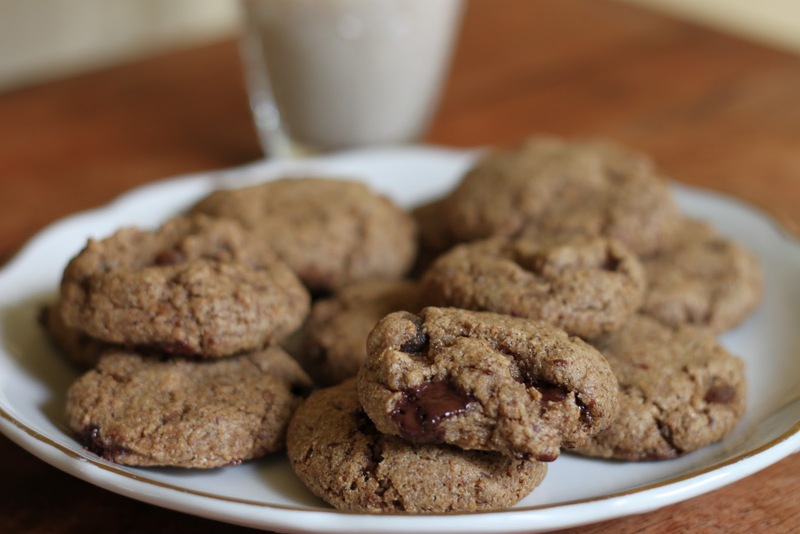 These Vegan Chocolate Almond Butter Cookies are easy to love. In a small bowl mix the flax meal and water. In a mixer, cream the almond butter and brown sugar. Whisk the other dry ingredients: whole wheat flour, baking soda, and cinnamon. Add flax mixture to almond/sugar mixture, then add in dry ingedients. Mix until incorporated. Using your hands grab off 1" size balls and stuff a hunk of dark choclate into the center of each, roll into balls and place on an ungreased baking sheet. I hope the whole world becomes open to the idea of vegan cookies and other desserts as being delicious. Because they are. And these look like they are scrumptious. I made only once a vegan cake and as a butter and chocolate lover I can say I loved it. lately I've been giving a lot of thought about vegan baking and is really tempting. Love the first photo of the oozing chocolate, made me drool instantly. I don't think I've made anything that is officially vegan, but these cookies have my mouth watering. So, I found your great blog when looking for restaurants in SLC on Urban Spoon, and I'm so pleased to have found it! My family will be driving from Helena, MT the weekend of February 12 for my graduation ceremony through WGU. We were considering Rodizio because it was highly recommended, but now I see there's an Ethiopian restaurant there! There is absolutely no Ethiopian food in Montana unless we cook it. We are also hoping to get a dim sum brunch in on Sunday… Comments? Recommendations? 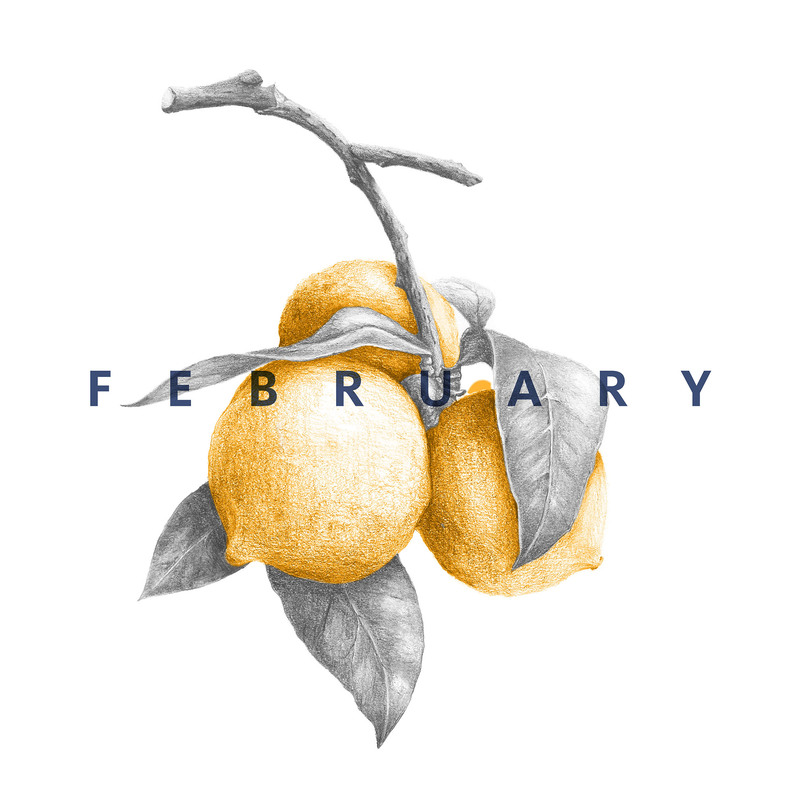 Also, we will be child-free on Saturday night, is there a good place for live music and drinks on February 12th? We're on a budget, so any suggestions would be welcome. 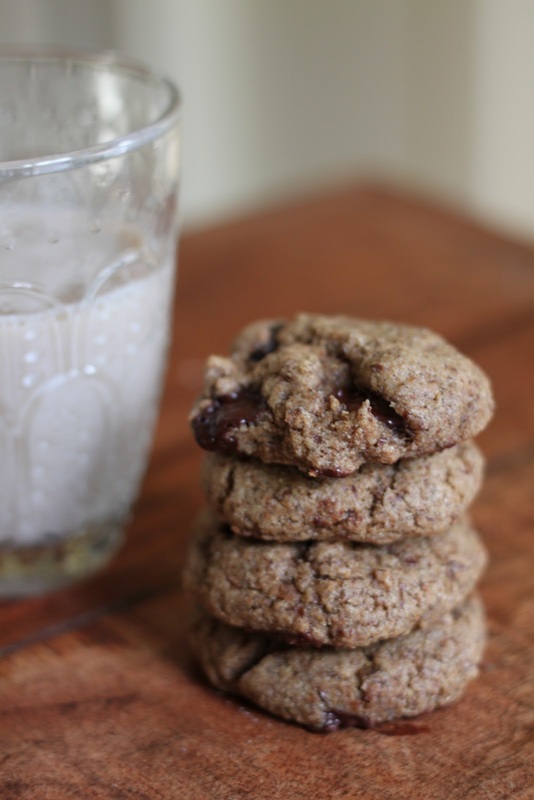 The melted chocolate oozing out of the cookie alone had me, but I'm even more excited it includes almond butter! I made these this weekend and they are awesome! I am posting my resulting cookies on Monday 🙂 Thank you! These were great! I used peanut butter instead of almond butter, and added a couple tbsp of soymilk, and 1 tbsp oil to the batter. I also used an orange spice chocolate bar, and topped the cookies with sugar before popping them in the oven. Big hit! 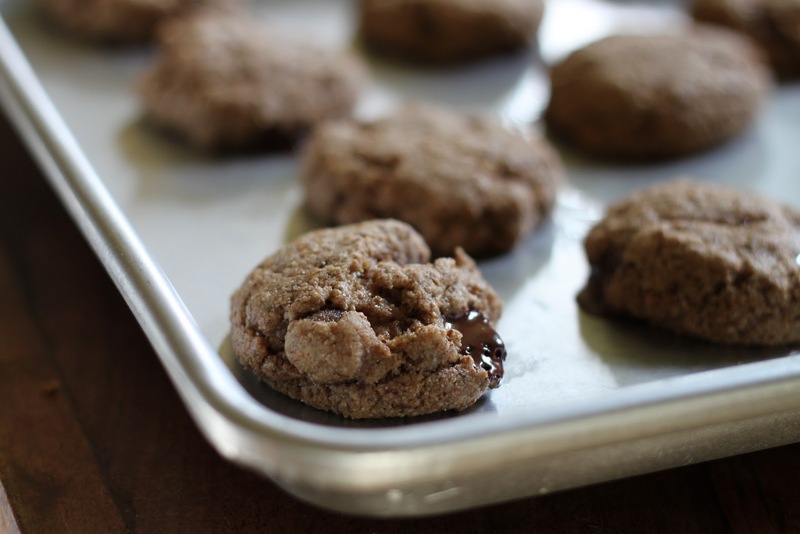 these look awesome and i bet that you could make them GF too by just using ground oats or ground almonds for the flour. I am partial to vegan AND gf baking…which basically means there's tons of trial and error to get things right. These look wonderful! Those look absolutely amazing! I may try these later this afternoon 😀 Thanks so much for the recipe! Make sure you use vegan chocolate everybody! Dark chocolate is actually quite good for you, but check the ingredient list for milk. I am also going to try making them with a tsp of almond extract to up the almond flavor. These look absolutely delicious, I cant wait to make them! These cookies sound really good. I love the use of almond butter. My name is Shirley Robert and I have been following your blog. I am a Registered Nurse for the ‘Assessment of Bariatric Surgery’ study which is conducted by us researchers at Beth Israel Deaconess Medical Center and funded by the National Institute of Health. The goal of this research study is to better understand patient’s experiences both before and after weight loss surgery. I am writing to you to request permission as the copyright holder to print your recipe it would appear in a newsletter and distributed to research study participants currently enrolled in the ‘Assessment of Bariatric Surgery’ study. Full acknowledgement would be given to you as the copyright holder. I greatly appreciate your consideration of this request. 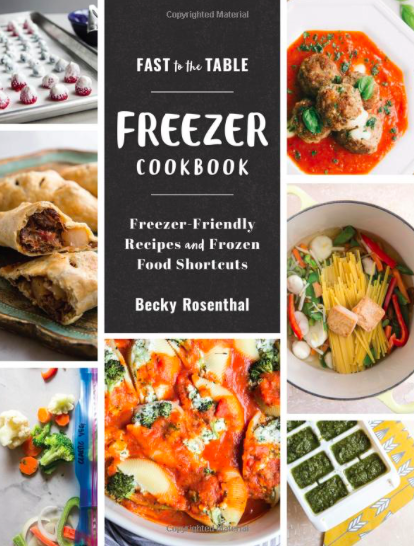 Please respond to this message to let to me know if we may use your recipe in our newsletter. FABULOUS cookies! Made these to send my Vegan son for his birthday! My husband loved these and was bummed that they were not staying at home for him! So I made another batch! 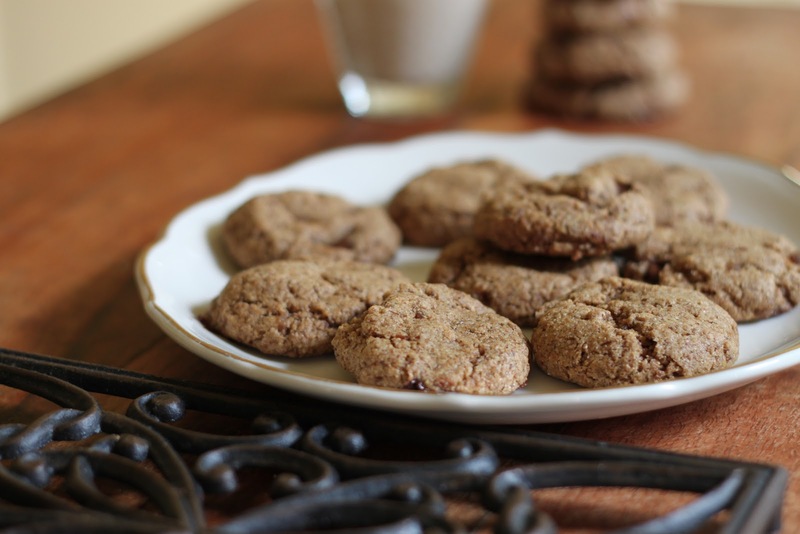 We both love them…another recipe to use to convince my husband that Vegan " ain't so bad"! Oh, they look glorious! What if I don’t have flaxseed meal?! 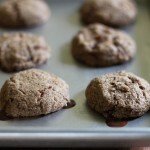 should I use more whole wheat flour!? 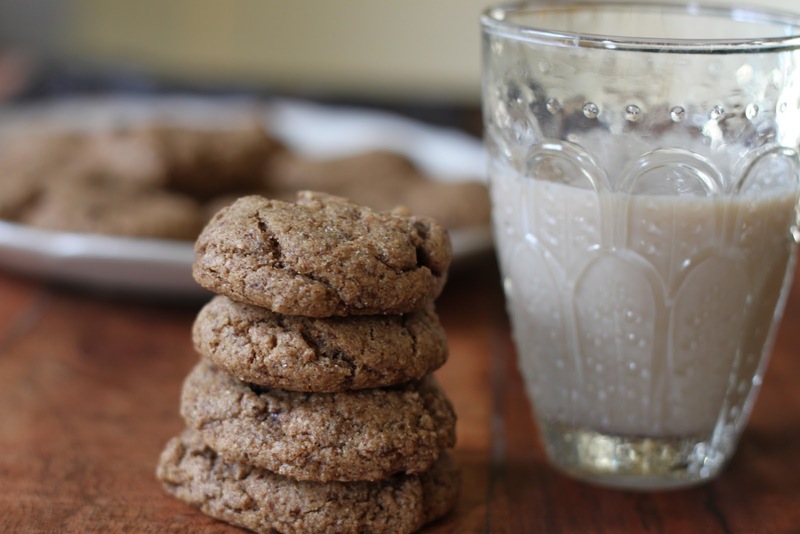 The flaxseed is actually what binds the cookies so you’ll need it or an egg replacer. Hope that helps!